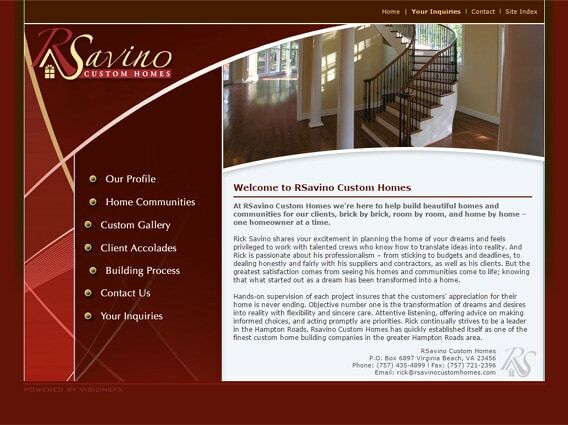 RSavino Custom Homes approached VISIONEFX to design a website with rich color and textures to reflect their home building designs. RSavino Custom Homes has quickly established itself as one of the finest custom home building companies.When searching Web Design Virginia Beach – Website development VA look no further than the web design experts at VISIONEFX. VISIONEFX, a Web design company based in Virginia Beach, VA. We provide extraordinary web design for small and large businesses throughout the United States. Our services include; custom web design, web development, e-commerce web design, Word Press web design, Joomla web development, SEO and web maintenance services. Call: (757) 619-6456 or email info@visionefx.net. For more information contact us here.